Welcome to Americas Best Value Inn Kansas City East/Independence. Our newly refurbished hotel is conveniently located on highway off of I-70 exit 12 busy interstate location nearby to the football and baseball ballpark stadiums as well as other attractions such as Independence Mall-event center-Kansas City Downtown Sprint Center-nearby Historic Downtown Gateway to Independence-Missouri into a Transient Leisure-Business and corporate district market area which is also close to many attractions such as Casino-Zoo and amusement park like worlds of Fun and Oceans of Fun water park. Independence is known as the Queen City of the Trails celebrating many annual festivals such as Independence Events Center and Missouri Mavericks 2nd Annual Corporate Golf Tournament. For golf aficionados visit Drumm Farm Golf Club and Stone Canyon Golf Course. For some shopping visit Noland Fashion Square- Bolger Square and Independence Shopping Center. Catch a flick at nearby AMC Independence Commons 20. Enjoy a tasty meal at one of the local restaurants such as Red Lobster - El Maguey or Cafe Verona. Our hotel offers great affordable rates with many amenities at the hotel for leisure and corporate clients. The hotel has parking in front of the guestrooms and easy convenient safe parking for autos-pick-ups and small trucks as well as construction workers vehicles. We invite our guests to enjoy our free coffee in our lobby. Stay connected with complimentary ultra high speed wireless internet access in our common areas and guest rooms. Step into the privacy of your own guest room with amenities including mini-fridge- satellite TV-ESPN-Showtime-free local calls and wake-up service. A microwave and a Forget Me Kit are available upon request. Children age 11 and younger stay free in their parents room with existing bedding. 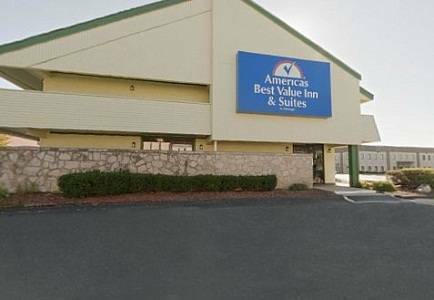 At Americas Best Value Inn Kansas City East/Independence We-ve Got You Covered from the time you hit the road until your head hits the pillow. Americas Best Value Inn Kansas City East/Independence is located off of I-70 exit 12. Our address is 13710 East 42nd Terrace Independence MO 64055. - Pure Water Oasis Inc.